On the eve of Halloween, girls start preparing for the brightest party of the year. If you have already thought over some awesome makeup and unusual accessories, you can complete your vampire image with a thematic manicure depicting witches, pumpkins or skulls – unchanging symbols of the evil holiday. Pumpkin manicure is hard to execute, because drawing all the details and the pumpkin’s burning “eyes” on a small fingernail is quite difficult. The pattern can be applied only on a few nails – this is more than enough. 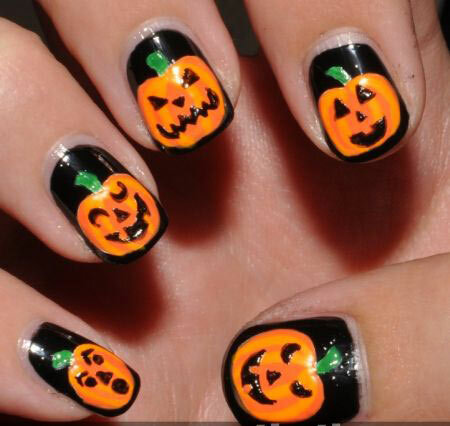 The manicurist will draw the pumpkin’s round shape and small leaves on the top with a fine brush. The sides of the pumpkin can be emphasized with darker colors, thereby giving it volume. Then, one can draw the eyes, nose, and grin. For the manicure to be more spectacular, you can do black French manicure before painting a pumpkin. Where else can you wear such manicure, if not at a vampire party? 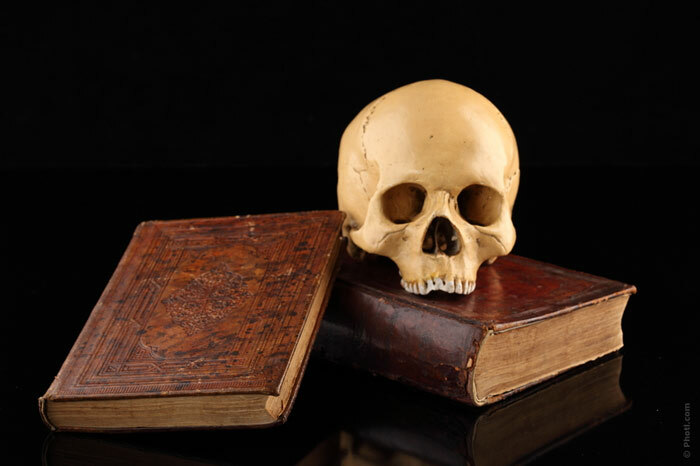 Skull or skeleton manicure with is easier to execute in terms of colors – this will require only white and black enamels – but it is rather complicated in drawing. 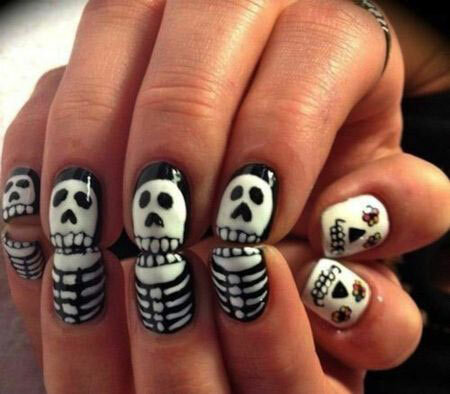 Nails are covered entirely with white enamel, then a ​​black “hole” is made, then you draw the skull or skeleton bones. Do not forget to apply a protective coating to keep such hard work perfect as long as possible. Bloody nails are one of the most popular designs at Halloween parties. 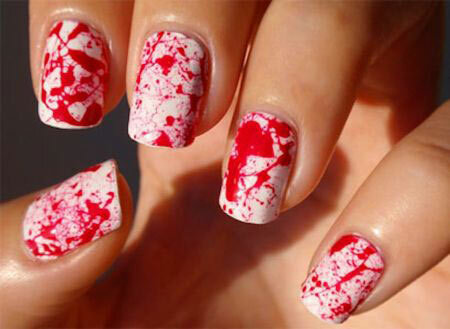 The effect of blood spatter on the nails can be achieved by “blowing” red nail enamel through a straw on the nails pre-lacquered with any shade of white, and drawing separate blood droplets with a brush. 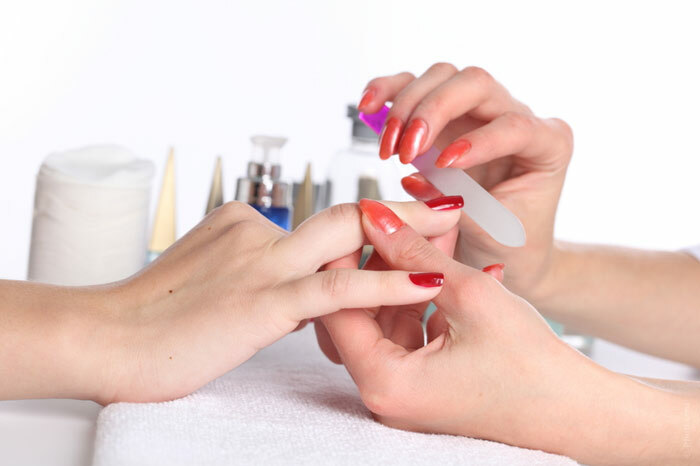 Despite the impressive design of the manicure, it is not so difficult to execute. Spiders and bats are the attributes of witches’ and vampires’ nightlife, without which the holiday is not a holiday at all. The technique of this manicure is close to that with skulls: first you cover the nails with white enamel, then you draw spiders, their body (a circle and legs), and after that – the bats as hexagons or heptagons. 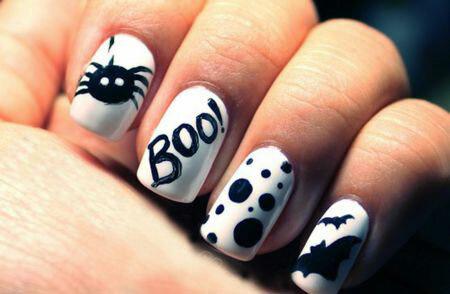 Better do it on separate nails for the drawing to be larger and more clearly visible. If you are not very fond of the evil, and the idea of ​​wearing these things on your nails does not delight you, then choose any other creative Halloween manicure. You can use any accessories, rhinestones, or even pieces of cloth from your Halloween costume. Any kinds of black and black-and-white nail enamels will do. Besides, you can do fluorescent manicure glowing in the dark. The main thing is that your image should be harmonious, with the colors matching each other.